Carpet Cleaning Experts at "A1 Carpet Clean" specialize in treating delicate rugs of all kinds, including Persian, Pakistani, Afghani, Chinese, Indian, Silk, antique and handmade. From inexpensive area rugs to Persian or Orientals, we can clean them. Area rugs can be a large investment and we and will treat your area rug like a piece of art. Whether cleaned at your home or place of business or taken to our shop, all area rugs will be put through a several step cleaning process that includes vacuuming, pre spotting, cleaning, and drying. By vacuuming your area rug both front and back sides, you will remove soil and sand as much as possible, which causes the rug to deteriorate quickly over time. Soil and dust particles act as tiny razor blades cutting away the fibers of your rug when you walk on it, and act like sandpaper. 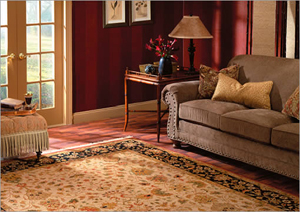 Avoid vacuuming the fringes – in most cases, the fringes are an extension of the foundation of your rug. The proper way to clean your rug is by steam cleaning, without the harsh chemicals and machines. Only a professional rug cleaner can do that properly. Our rug cleaning experts will clean your rug gently and with great care. It is time consuming, but the results are amazing. By steam cleaning your rugs, we will save your rug from destruction by accumulation of soil and sand which accelerate the wear of the rug or carpet by cutting the fibers and breeding ground for mildew and mites. You should rotate your rug on a yearly basis. By rotating your rug periodically, you will help equalize the effects of wear. Also, be on the lookout for sun fade, which can be mitigated to some degree by rotation. If possible, avoid placing the rug in the sun altogether as it is virtually impossible to even out the color. You should inspect your area rugs periodically for moths. Moths will hide on the rug under furniture or in dark areas. Moths will generally be evident by their casings, which look like grains of rice. You should look at the rug carefully for evidence of insects. You should inspect your area rug for any damaged areas or wear and tear and address the problem as soon as possible to avoid further wear. Handmade rug repair is expensive. It is time-consuming and very labor-intensive. Therefore, any damage to your rug should be addressed immediately. The longer a damaged area goes unrepaired, such as a spill or animal accident, and the longer your rug goes with moths eating it away, the harder it will be to repair the damage. In some cases, the stains will not come out or if they do eventually come it, the repairs will be very costly. Area rug can sustain a major damage if a potted plant is placed on it. It is virtually impossible to ensure that moisture will not make its way to the rug, and the carpet will rot out from this moisture. This is an extremely expensive repair. If you value your rug, never ever put a potted plant on it. When you notice urine on your area rug, call "A1 Carpet Clean" Experts the professional rug cleaners because there is a very short window period in which to address urine on a rug before it turns to a permanent stain. It is highly recommended that when you get a new puppy, or get a new rug when you have a young dog, that you store the rug away from the dog’s reach until it is old enough to be housetrained and out of the chewing stage. Before storing your rug, it should be cleaned and sprayed with insecticide, then wrapped in protective plastic. The rug has to be completely dry. Do not use newspapers, brown paper or Moth balls. If you live in a climate where humidity is high during some part of the year, make sure that there is some way to circulate the air to avoid mildew problems. Store the rug in a clean, dry place, and out of the reach of rodents. You should avoid storing rugs directly on the floor; carpet beetles in particular like to take up residence between the floor and the back of your rug. We highly recommend periodic inspection of the rug to make sure there is no evidence of infestation. Vacuum the room thoroughly to eliminate insect-attracting dust. Remove dust from all baseboards and windowsills as well. If you are not satisfied, then our Carpet Cleaning Experts are not satisfied. That’s why, in order to make sure you will get exactly what you need, we offer you a free carpet, rug and upholstery cleaning estimate appointment on site, to determine what would be the best course of action in your case. That how we know you will get the cleaning you deserve. Our representatives are happy to respond to your requests and offer you knowledgeable and friendly assistance. Call our Carpet Cleaning Experts at 949-383-4831 and get a free phone estimate. Our staff offers a 100% satisfaction guarantee on each and every service package.